Seibuen Yuenchi is another park with its own train station, or to be more accurate, it's own train line; the Seibu Tamako train line actually terminates in front of the park gate. Trains operate every twenty minutes, as there is only a single line going between the Hagiyama and Seibuenyuenchi stops. We arrived at the park to find the entrance surrounded by at least three hundred teenaged girls, all of whom were towing suitcases, presumably full of clothing. Fortunately they were not in evidence inside the park. The Hello Kitty Angel Coaster was not operating today. The usual phrase for describing this situation is Standing But Not Operating, or SBNO for short. George coined a new term for today, though; HNFT. I'll leave it to the reader to decode in full, but suffice it to say that the abbreviation refers to an essential part of any roller coaster which was conspicuous by its absence. As such, the only available coaster for us to ride was another classic Togo design, Loop Screw (#939). My theme park travels have led me to see many unusual things, but it is with a certain amount of incredulity that I have to record that this ride has a fully seated queueing area. Each row contains passengers for one train. The idea is brilliant and works well, only falling short on quiet days like this one when there's less than a train load of people waiting to board. Either way, the coaster was actually very good too, albeit with one problem; it is designed for Japanese people. Anyone over about five foot nine can only fit in the front half of a car, and even then it is uncomfortably cramped due to a steel bar for passengers to hold on to. I'd have gladly ridden a second time, but I doubt my knees would have taken it. We spent about twenty minutes ambling slowly around the rest of the park, which is largely targeted at young children. There were a number of adult rides around, but the only one which really caught my attention, an Intamin parachute tower, was unfortunately out of commission. One hundred megabytes of photos later, we decided to leave. Our plans for the afternoon called for a leisurely return to the hotel to collect luggage ahead of a two and three quarter hour bullet train trip to Osaka. However, we'd finished Seibuen Yuenchi sooner than expected, allowing us to make make an earlier Shinkansen, thereby allowing an extra hour in Universal. It would be a very close run thing, and would involve some serious rushing, but it might be possible. Skipping the better part of an hour of power walking while towing suitcases I'm pleased to report that we made it onto the earlier train, utterly out of breath, with a glorious three minutes to spare. The Japanese, incidentally, make full use of their superb train system. The bullet train had sixteen cars, all of which hold a lot of people. Although they were fairly full, it was still possible to reserve a seat ten minutes before departure. It's always an experience to see the land rushing past you at high speed; I've put a video here for the curious. We were most amazed, however, at the sheer number of people in the various stations. 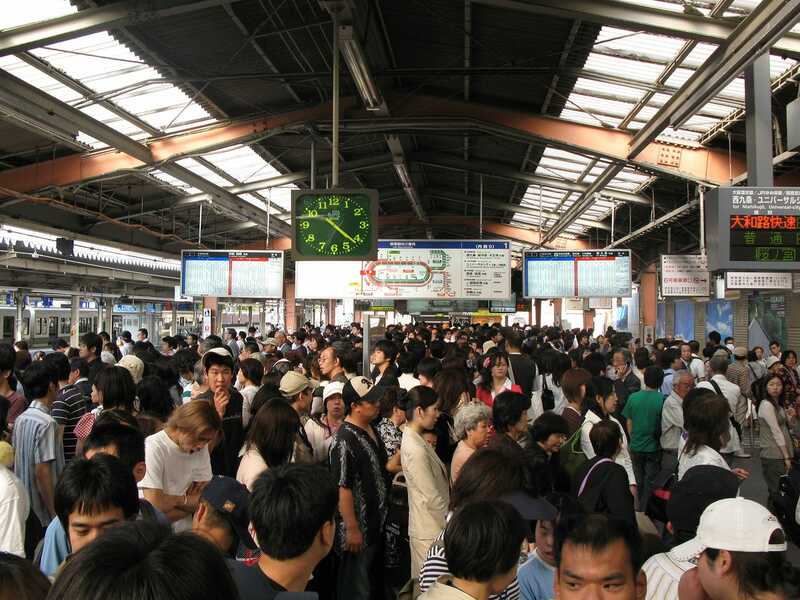 The photo above covers roughly one third of two platforms in Osaka station, and was taken, not at rush hour on a weekday, but a little after four in the afternoon on a Sunday. While I think of it, Japan is also not a place for the self conscious westerner, as there were no other gaijin in the station at all. 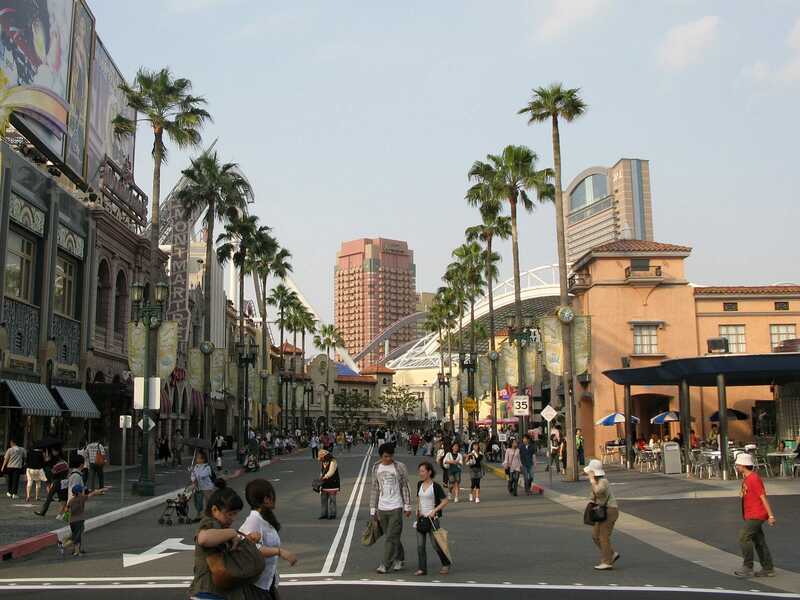 Both of us visited Universal Studios Japan two years ago and tried the majority of attractions in the park. For this reason, we elected today to go for the edited highlights. As the park was utterly packed, and we had limited time to spare, we decided to buy a book of express passes, guaranteeing us instant access to four rides. Each ticket was valid for three of the park attractions only, presumably to stop certain patrons monopolising a certain shiny brand new coaster. We'd never even think of doing something like that, of course. Our reason for visiting again was also the destination of ticket number one; Hollywood Dream: The Ride (#940). 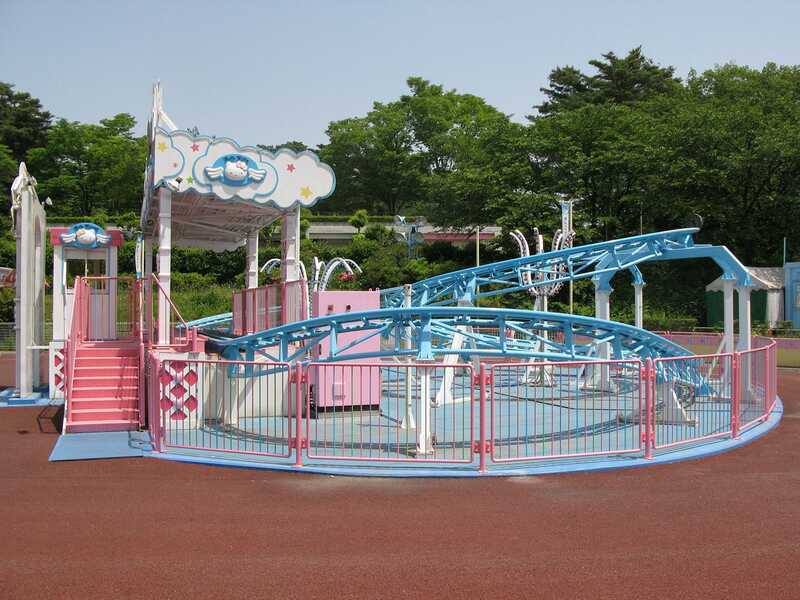 The ride features five different selectable sound tracks (Bon Jovi, Eminem, The Beatles, and two examples of J-Pop) played through a speaker system that allows everyone to enjoy the selection of their choice without being blasted by the seat next to them. It also features sparkling white lighting all over the front and sides of the train. During the day it catches the eye now and then, but at night it is visible at a significant distance. It looks fantastic, and more importantly, it is a great ride, especially at night when passengers can see the lights of the park flashing past them. Ticket number two went on Backdraft, the only one of the three choices we hadn't done on our last visit. The main crux of this attraction is a room where just about everything goes on fire. This bit was done pretty well, though I was glad we'd chosen the back row; the heat was intense. I shudder to think what the gas bill is like. We did our best to cat-nap through the two pre-shows, which were entirely in Japanese and utterly impossible to follow. I've written before about Spider-Man, so I won't repeat myself other than to say that it is still quite possibly the best dark ride in any park anywhere. Though a clone of the version in the United States, the soundtrack has been localised, which certainly adds novelty to the experience. Last but by no means least came ET. After enduring a few tedious pre-shows guests are led to the entrance of a dark ride very reminiscent of Droomvlucht at Efteling (or Peter Pan for American readers). Passengers sit into bicycles complete with a metal basket on the front for their baggage. These hang from an overhead rail; a bit of a curiosity to be sure, but one forgets about it soon enough as one is enveloped by the detail, colour, and variety of the scenery below. The ride is broken into three sections; an opening area where you pass through various science experiments; a city area where you move over rooftops, and a tour through what is presumably intended as our hero's home planet. As dark rides go, this is right up there with the best of them, and I would definitely have gone through it again given more time. We managed to edge our way back into the Hollywood Dream queue just moments before they blocked it off for the night, almost two hours before park closing. This time I chose the second example of J-Pop, which appears to have been specially composed to work with the ride. Unlike the first, which sounded like a Dance Dance Revolution track on a bad day, this one worked very well indeed. There was a musical climax just as the train went over the top of the lift, and then other points where the music was synchronised to the movement of the train. Apparently B&M are going to try some more choreography in the upcoming Hard Rock Park, and if this ride is representative of what they can do then I can't wait to try it.